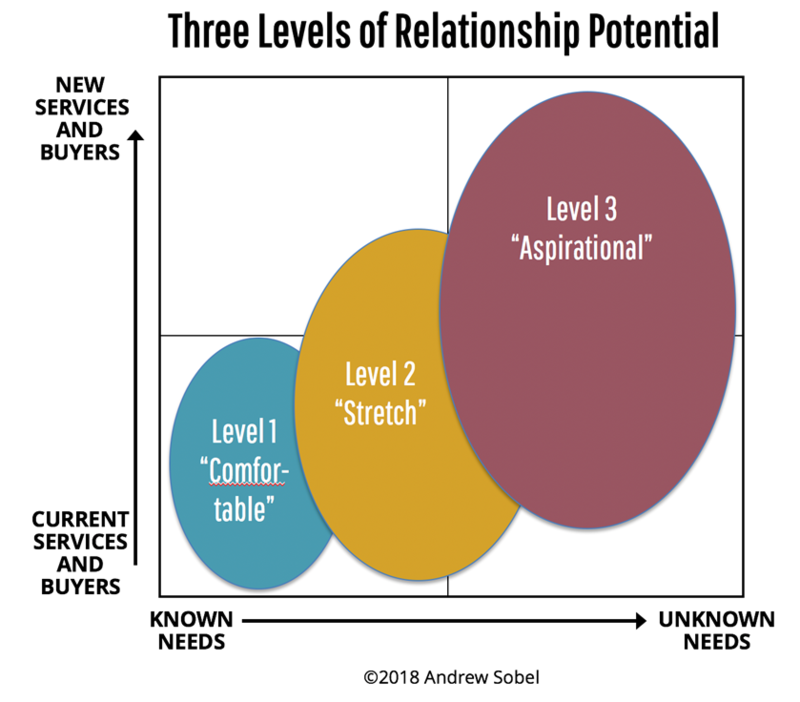 Have You Captured all 3 Levels of Client Relationship Potential? A client of mine implemented an account planning process and asked all their partners to estimate their current share of each client’s business. Sometimes, this metric is referred to as “share of wallet,” although I dislike that term because it sounds like you are stealing the client’s wallet rather than helping them make more money. For one of their clients, a highly experienced partner and his team proudly announced that they had already captured 80% of the client’s potential spending on their firm. Therefore, he told me, there was no possible way to grow the relationship further. The CEO, who had retained me to advise them, was skeptical—and so was I. This was a $20 billion corporation! I looked more deeply into the matter, and sure enough, this partner was only measuring their share of the existing services and solutions they were providing—the ones he and his team were experts at. When we recalculated the market share figure based on ALL of the services the firm could realistically offer to this client, it was less than 5% (I was pretty sure that was a lower number than 80%!). This partner had only looked at the first level of client relationship potential, which I’ll describe below. I helped them reframe how they looked at potential, and by aspiring to what I call Level 2 and Level 3 potential, they started growing the relationship by 25% a year. …Based on known needs—on the existing client framing of their needs. This is a very comfortable place to be. You might even be steadily growing the relationship, making you feel like it’s a real success. Why do we stay at the Comfortable Level? Well, it’s a low-stress place to hang out in. You may genuinely feel that your only chance at growth is to do more of what you are doing with the same folks—the same executive buyers. You may not feel comfortable talking to your client about additional services when you aren’t the expert in them. But if you stay at Level 1—or at least if you don’t try to move to Level 2—you’re actually providing bad client service. Do you believe you offer a great service or product? If you do, it should be anathema not to work tirelessly to ensure your clients are aware of everything you can do to help them and that you have spoken to every potential buyer for your services within the client’s organization. Why would you let them buy brand X? What your firm knows not just what you know—i.e. : All of the services that you offer that your client could possibly buy. Simply by reframing the opportunity from “Me” to “We” the business potential with your client can grow exponentially. “Of course I think this way,” you might say. But do you act on your thinking? Many if not most of my clients struggle with this challenge—that is, to deliver the whole firm not just themselves. Yes, there are barriers—for example, some clients say they want to choose the “best of breed” from many suppliers, and just because they buy training services from you doesn’t mean they will also use you for change management or performance assessment. The barriers are both internal (e.g., lack of collaboration across your firm) and external (e.g., clients are already using other incumbent competitors in areas where you’d like provide services). And yet…many trusted advisors I have known have succeeded brilliantly at growing Level 2 relationships. They learn just enough about their company’s services offerings to be able to have a first conversation with a client about a need in that area. This means, for example, knowing 3-4 key questions to ask to explore the potential need. They don’t cross-sell—rather, they uncover an important need and then create a buyer. They share thought leadership, engage in a discussion of the client’s challenges or issues in a particular area, and then if necessary bring in a colleague who is expert in that topic. They make it a point of showcasing their firm’s capabilities to their client—sometimes by offering to put on a lunch-and-learn or a ½ day seminar on a topic of interest, or by inviting the client to a networking event with other, similar clients. They intentionally build their INTERNAL network and consider it as important as their EXTERNAL network. They know that strong relationships with expert colleagues, and leaders in their organization who can help make resources available, are critical to reaching Level 2. They broaden their conversations with the client. They don’t artificially confine their discussions to their own pocket of expertise—they have wider ranging conversations where they use powerful questions to explore their client’s agenda. 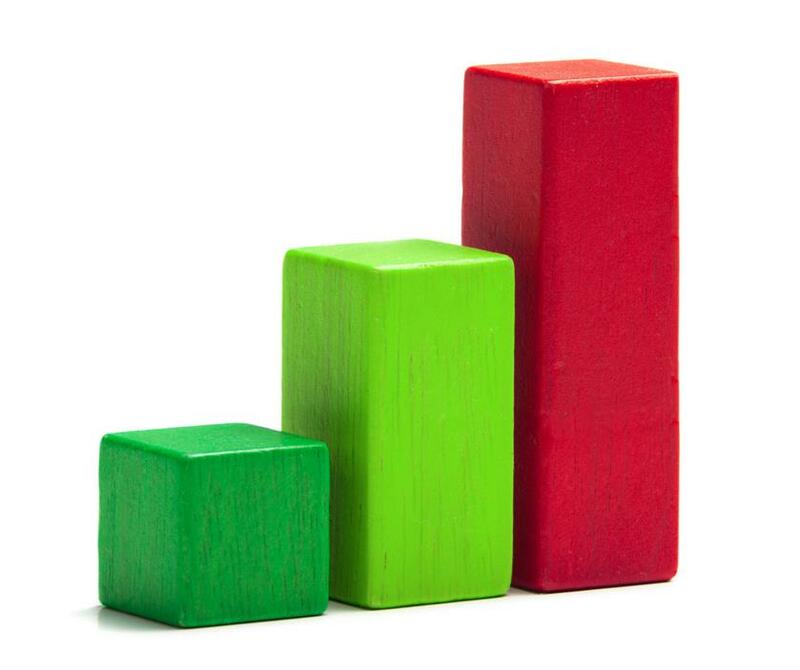 If you’re a solo practitioner or small firm, you may say, “Sorry Andrew, but only Level 1 is available to me.” Really? No matter how specialized you are, you can always move up into strategy and design or down into implementation. You can identify additional ways to support the client as they use your solutions. There are many ways you can edge into Level 2 potential. Level 2 is great. But there’s more. …Plus, the potential of currently unrecognized needs and opportunities, based on the client’s highest-level aspirations and goals. This is the arena in which the truly great business developers excel. At Levels 1 and 2 you are mostly “Demand Reacting.” But here, you are “Demand Driving.” You are identifying needs and opportunities your client hasn’t yet uncovered or at least focused on, and are exploring their highest-level aspirations and how you can help enable them. For example, one of my clients was able to reframe an IT maintenance project as a program to enable a breakthrough customer experience. This caught the attention of the CEO, whose had recently introduced a new set of “customer-centric” strategic initiatives. With that as a start, my client grew to become a strategic advisor to the company, and the relationship eventually tripled in size. Is this easy to do? No, because client executives are usually pretty smart and experienced, and they’ve spent a long time thinking about their problems. They believe they know what they need and want, right now. But you have an asset they lack: The cumulative experience of working for dozens or hundreds of clients with similar challenges and opportunities. Focus on developing relationships with the c-suite and other key decision makers. They are more open to aspirational conversations, and they usually take an enterprise-wide view. Your starting point should always be client’s agenda of critical priorities, needs and goals—not flipping through long PowerPoint presentations about your great solutions as soon as you sit down! It’s fine to share an innovative solution you have—but there should be some a priori notion that the client has a need in that area. Ask a lot of open-ended, “why” and “what if” and “how” questions. “What if you had more time or additional resources, what else would you try to fix?” or “Why have you decided to launch this initiative now? What strategic goal does it support?” or “How will you achieve future growth?” and so on. Also ask what I call “Dreams” questions about vision, aspirations, and legacy. Be current about what competitors are doing and how other companies—inside or outside of the client’s industry—are tackling similar challenges. Look for executives with a real sense of urgency. The best clients are often high motivated zealots who have a drive to shake things up. The TOTAL potential of a relationship is of course the sum of Levels 1, 2, and 3—it’s when you fill in the entire matrix, below. So, what’s the potential of your client relationships? Frankly, it’s their aspirations plus your vision and imagination for helping them succeed! And that’s huge. *Note: Known needs are ones identified and recognized by the client (“we need better financial controls!”). Unknown needs are needs they have but which they haven’t recognized (“Hmm…we didn’t realize how vulnerable our systems actually are to cyberattacks!”).